Described by USA Review as doing for the Greek soul what flamenco does for the Spanish, Eleftheria Kotzia has toured regularly in Europe, Canada, the United States, South America, North Africa, Australia, N.Zealand and the Far East. She has performed both as a soloist and with orchestras at many of the great international festivals, including the 10th Anniversary Series of the D'Addario Foundation for the Performing Arts in the USA, the Festival Estival in Paris, the Tavener Festival in Athens, the Segovia Celebrations in Spain, the Guitar Foundation of America (G.F.A.) in the USA, the 10th Anniversary Series of the Festival de Guitarras Del Mundo in Argentina, the City of London Festival and various other festivals around the world. Born in northern Greece,in Alexandroupolis ,Eleftheria Kotzia studied guitar at the National Conservatory in Athens, the Conservatoire National Supérieure in Paris, and finally at the Guildhall School of Music in London. Among her teachers have been Julian Bream, Alexandre Lagoya, Dimitri Fampas, David Russell and Timothy Walker. She was the winner of the first prize in the 6th International Guitar Competition in Milan. When Eleftheria made her London debut the Times admired her skill, unfailing beguiling tone and her ability to vary her touch with fluency. Since then Eleftheria Kotzia has performed for various radio and TV stations, including the BBC and WNYC and has given recitals at some of the most famous concert halls in the world, including the Merkin Concert Hall and the Carnegie Recital Hall in New York, the Herbst Theatre in San Francisco, The Wigmore Hall and theSouth Bank Centre in London, the Megaron Concert Hall in Athens, Les Halles and the Ampitheatre Richelieu in the Sorbonne in Paris, the Jubilee Hall - Raffles Hotel in Singapore , The Rudolfinum in Prague. Eleftheria Kotzia has an impressive list of recordings to her credit. Among them the first recording of Michael Tippett's The Blue Guitar, which was described as life enhancing , enjoyed unanimous critical acclaim and was selected by Gramophone magazine as aCritic's Choice Recording of the Year. The American Record Guide hailed her as a wizard-a strong sensuous player with bite and sass . John Tavener's only solo guitar work, Chant, was also recorded for the first time by Eleftheria Kotzia, in a special adaptation made for her by the composer. 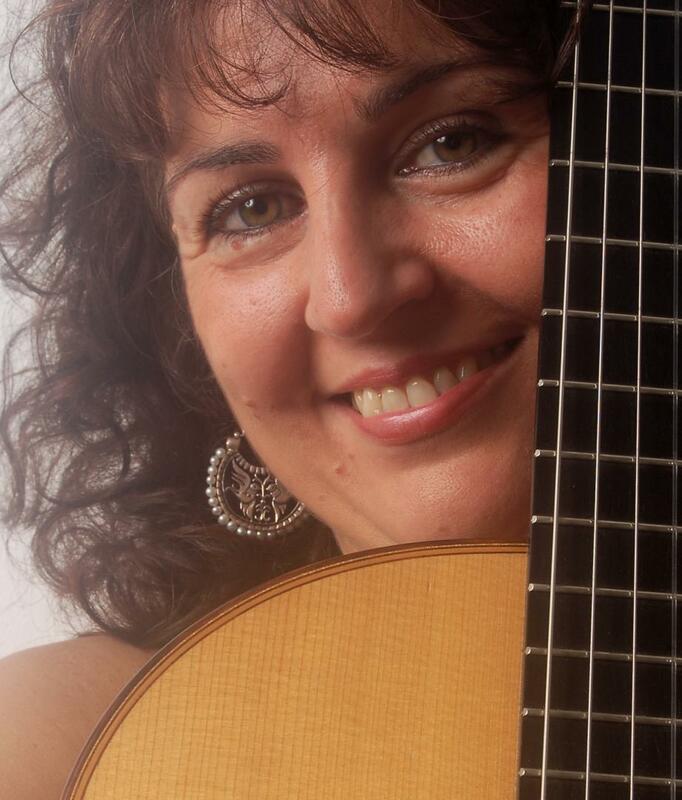 Her CDs ‘Fuoco’ on Harmonia Mundi - Mandala and ‘La Guitarra Latina’ on Chandos have received rave reviews. Kotzia was selected to represent Greece in London's Millennium Celebrations :String of Pearls . She played the guitar part in the first performance of John Tavener's Fall and Resurrection in St Paul's Cathedral, London, which was televised live and subsequently issued on CD/DVD. Eleftheria Kotzia has been on the cover of the major guitar magazines (Classical Guitar, Guitar International ) and on the cover of the music journal of the Incorporated Society of Musicians (I.S.M) and the Panhellenes. An important initiative has been her encouragement of non-Greek composers to write Greek -influenced music for her. Her uniquely pioneering work has resulted in compositions by such composers as Stephen Dodgson, Carlo Domeniconi, John Duarte and Edward McGuire, all of them influenced in their different ways by the richness of the Greek musical heritage. She has also presented numerous works by Greek composers in her recitals around the world. Other compositions dedicated to Eleftheria Kotzia include the ‘Levantine Suite’ by Dusan Bogdanovic, and works by the Chilean composer Edmundo Vasquez. Estonian composer René Eespere wrote a guitar concerto for Eleftheria that she premiered in October 2007 in Tallin, Estonia and subsequently recorded it. Eleftheria Kotzia teaches at the Royal Welsh College of Music and Drama and gives masterclasses and training courses around the world. She is a frequent judge in international guitar competitions. Within the Catalogue of Lathkill Music Publishers she directs the Eleftheria Kotzia Series which features new, contemporary music for guitar. She is the writer of the guitar method ‘le cahier de ma guitare/guitarobics’. Since 2007 Eleftheria kotzia is the director of the International Guitar Course and Festival in Ligoure , France.